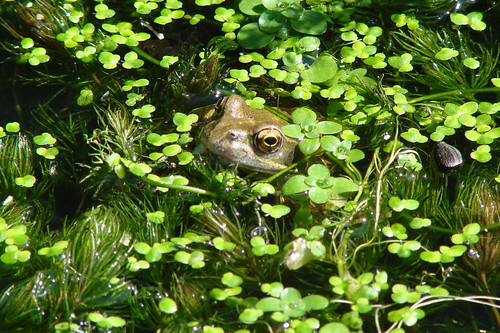 Counted eight frogs in the pond this morning... looking like they are also wondering when spring might arrive. 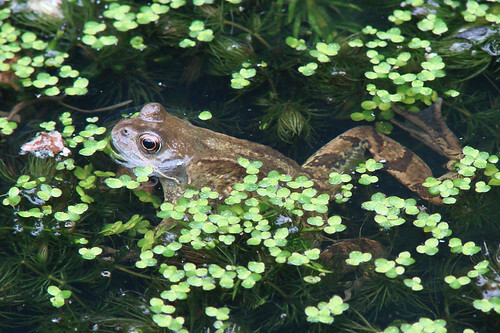 The weather was actually more like a proper summer's day today, and I counted a baker's dozen of frogs, sunning themselves today in the pond. This Quintuplet grouping of frogs in the pond- one large, and four smaller ones gathered around. 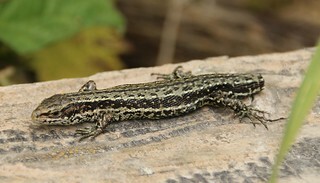 I really like lizards, and see them so rarely. His tail will grow back, won't it? I think I've heard that they have that ability. No idea, I hope so! They do usually grow back, though the new tail tends to be obvious as a regrowth. 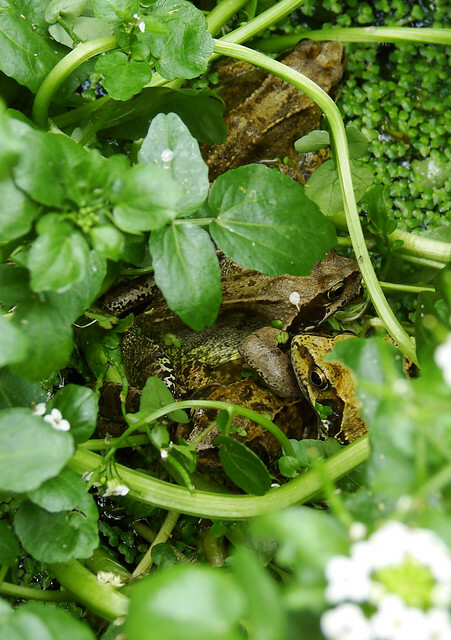 Amphibian of the day for me was this frog lurking contentedly in the duckweed. ...and another one of the frogs this afternoon. They seem to have decided to all pile in on top of each other; all together I counted 17 of them in the pond. I distubred something under a corrogated sheet this lunchtime, I think it was a baby Grass Snake. Was very small and well marked. Thought it might've been a Slow Worm at first but markings seem too detailed. Is it right time of year for baby snakes to be around? Only had a couple of seconds before it disappeared into the bushes. Juvenile Slow-worms are very well marked. I would have thought a bit early for juvenile Grass Snakes. A large Red-eared Terrapin last night at a local nature reserve in Barnes. Also a couple of Marsh Frogs calling. 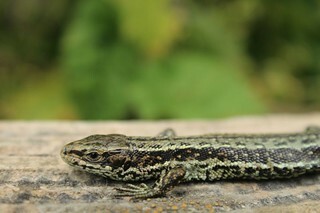 Several Common Lizards on the boardwalk today. 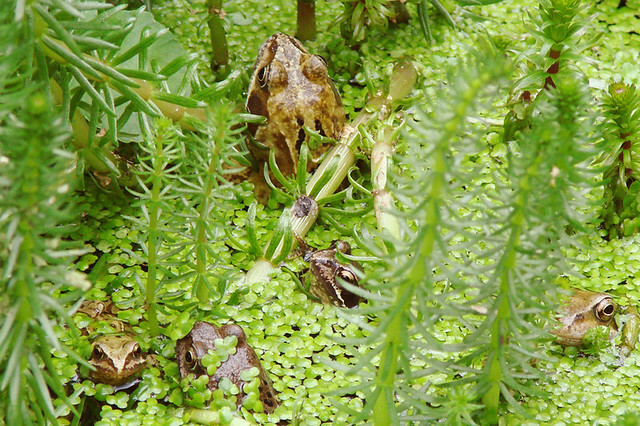 As we got out of a friend's car at the London Wetland Centre she spotted 2 handsome Marsh Frogs sitting on a piece of wood in a duckweed covered dyke, sunbathing.They looked quite amusing with duckweed on their backs. Surprisingly these were the only ones we saw + didn't hear any calling.